During Viking times King Canute, a Danish ruler of England, was worshiped and flattered by his subjects. They thought he possessed supernatural powers which could keep them safe and happy. Being a wise monarch, Canute looked for a dramatic way to teach his subjects about Higher Power. A little consideration of what takes place around us every day would clearly demonstrate that a higher law than that of our personal will regulates events. It is only when we open ourselves to the unseen forces which beckon to guide us that we free ourselves from the false ego-self and penetrate the inner strength of real being in the physical and noncorporeal realms. The Swiss psychologist Carl Jung was the first modern thinker to define the term “synchronicity” as a word to describe the perception of meaningful coincidence. Most often we do not see the pattern of synchronicity as it weaves throughout our lives. There are many various ways in which synchronicity makes itself known to us. We may be thinking of an individual whom we have not seen in a long time, only to surprisingly connect with them a short time later. At a bookstore we may find ourselves unconsciously directed to a precise volume that is highly essential to our personal life at that moment. A stranger may, for some unknown reason, frequently cross in our life in a way that is beyond what we would expect by pure chance. Casual messengers surround us constantly but we must learn how to acknowledge these signs and interpret them. This seemingly imperceptible and somewhat telepathic ability can be fine tuned within the minds of most people who have the presence of mind to seperate the inner-self from the exterior-self. Like a guardian spirit, the messages attempt to convey to us that our lives are about to shift in some new direction. When Abraham Lincoln was young he lived in a small farming community in Illinois. At that time Lincoln felt that his destiny demanded more than the life of a local craftsman or farmer, like the residents around him. One day he encountered a peddler who had obviously fallen on hard times, and who asked Lincoln to buy an old barrel of goods, mostly worthless, for a cost of one dollar. Lincoln decided to give the peddler the money and he cleaned out the barrel. What Lincoln happened to find at the bottom of the barrel of miscellaneous items to his delight was a full set of lawbooks. This seemingly random unintended purchase caused him to focus his studies to eventually become a lawyer, and ultimately find and attain his well-known place in history. We do ourselves much service when we leave the doors open to initiation and to not discount the many casual signals that beckon to us. It was Jung’s belief that archetypes manifested themselves, at least occasionally, in physical events and in states of mind at the same time, also, under the law of synchronicity. Jung refers to the case of Swedenborg, who experienced a vision of fire in Stockholm at the same time as an actual fire was raging. Jung considered that that some change in Swedenborg’s state of mind gave him temporary access to “absolute knowledge” to an area in which the limits of space and time are transcended. We contact the higher powers only as we loosen our attachments to them. Most people’s waking hours are consumed with useless mundane efforts. It is a tendency to place many unnecessary needs and demands upon ourselves based upon our ego-directed drives. These areas of negative influence all interfere with the natural flow of the real gift. One must be aware of a negativity before it can be destroyed. Some of our negatives are unknown to us and it may require a synchronistic shock or crisis to reveal them. All the triumphs and failures that can be experienced by man in this physical world are valuable lessons for our developing spirits, which are characterized and expressed by the folk-god archetypes and legends found within our indigenous mythological lore. Synchronistic phenomena among the Aryan race occur not uncommonly when a constellation of active psyches converge to the foreground of an ethnic archetype such as Wotan, or other formidable patriarchal or matriarchal gods and goddesses. These powerful, influential and usually emotional energies are able to move the unconscious, and with it the archetype, into the foreground of the conscious. The microcosm of our interior psyche by way of the archetype reflects itself on the screen of the macrocosm of sense perception. Inner eternity and outer eternity meet in man, and thus we come to realize that our bodies serve as virtual portals between two very real and highly profound worlds. 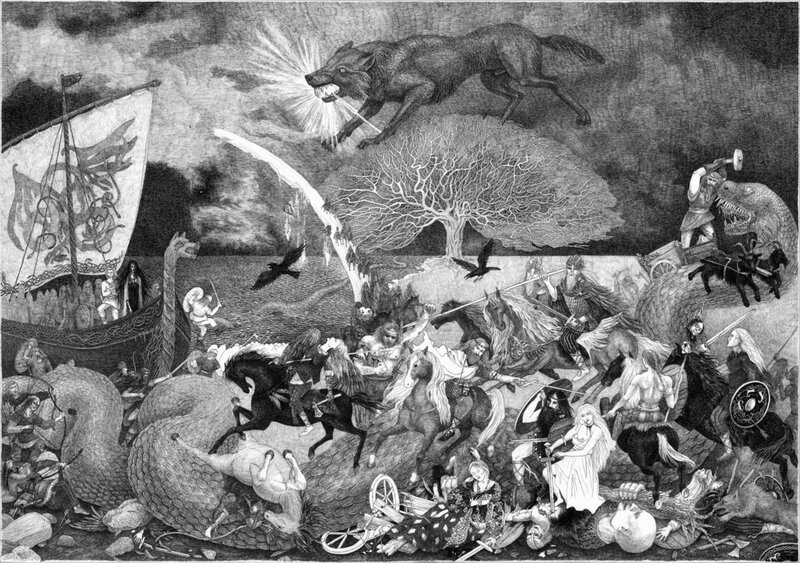 Jung maintained that an ethnic god and archetype, such as Wotan, is not purely psychic—the stuff of dreams, but rather psycho physical—only partly psychic. By this theory the archetype is capable of manifesting in a dual fashion, appearing internally as a psychic image, and externally as a physical event, at times even as a physical object. The archetype then, when manifesting in a synchronistic phenomenon, is truly awesome if not outright miraculous—an uncanny dweller on the threshold. At once psychical and physical, it might be likened to the two-faced Roman god Janus. The two faces of the archetype are joined in the common head of meaning, which is the chief characteristic of human individuation. The deeper we probe into gnostic mysteries we find that the union of man and archetype, as well as life and spirit, are not just a casual relationship but an essential element to free us from false ego and the confines of a lower conscious physical world. God-like image and essence are not made, they become. The ethnic god Wotan has co-existed with Aryan man since the dawn of time through a wide range of patriarchal images. The popularized Viking characterization is but one of the many masks of Wotan. Today, the presence of such manifesting divinities might surface through some form of modern dress as apparition entity of a mystic configuration. Our ethnic divinities are never static, congealed in divine perfection, but not unlike man, are also growing, learning intelligences of many degrees much higher yet similar to our own. Synchronicity is a means by which our gods and ancestors can reach out to us and through us and in turn provides us with available pathways to higher being and consciousness. Man is the individualization of all functions, affinities and powers of the universe, and consciousness is the measure of individualization rendering actual that which is virtual in the cosmic memory. This entry was posted in Uncategorized on 11/27/2015 by Völkisch Pagan.